The true realities of wearing a “costume” such as this were not considered or debated in Mrs. Pychowska’s article. Conversely, a passage in an article from the June 1877 issue of Appalachia put an exclamation point on the true dangers women faced as a result of the clothing they were forced to wear while tramping. The author related the story of a guided hike on Mt. Washington during the prior year. While descending Tuckerman Ravine one of the ladies in the group paused momentarily to stand atop a large rock above a 25-foot outcrop. 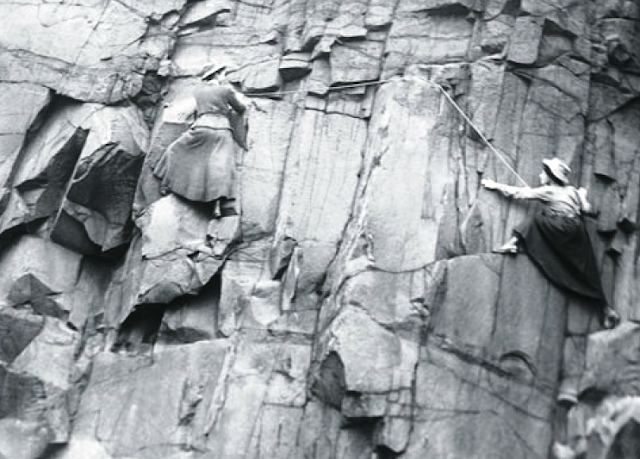 Unbeknownst to the hiker, her tattered dress had become caught on a sharp protrusion on the rock. When she attempted to jump to another large rock the snag violently jolted her back, and left her dangling upside down above the abyss. Fortunately her mountain guide was nearby and was able to pull her to safety before falling. With the arrival of daylight the next morning George and Lucy tragically discovered that they were within sight of the Tip Top House. Had they known that they were that close they could’ve easily made it to safety, and Lizzie likely would’ve survived. After her death tourists and hikers began piling stones on the spot where Ms. Bourne died. A stone monument now stands on that same spot to mark and commemorate her passing. Did Lizzie’s attire contribute to her death? Perhaps. She wore a heavy skirt, petticoat, pantaloons and stockings. Nicholas Howe, author of Not Without Peril: 150 Years Of Misadventure On The Presidential Range Of New Hampshire, estimates that Lizzie may have worn as much as 45 yards of fabric! When this outfit became soaked in cold rain there’s no doubt this would’ve weighed her down, resulting in more stress on her heart, and certainly would have accelerated the effects of fatigue, exposure and hypothermia. An article published on the Tramp and Trail Club of Utica website notes that by the 1920s women had solved the problem of impractical skirts by stuffing them in knapsacks once they had reached the trailhead, and then putting them back on before returning to town. Bold and daring women eschewed skirts altogether and simply wore knickers with long socks from their home. 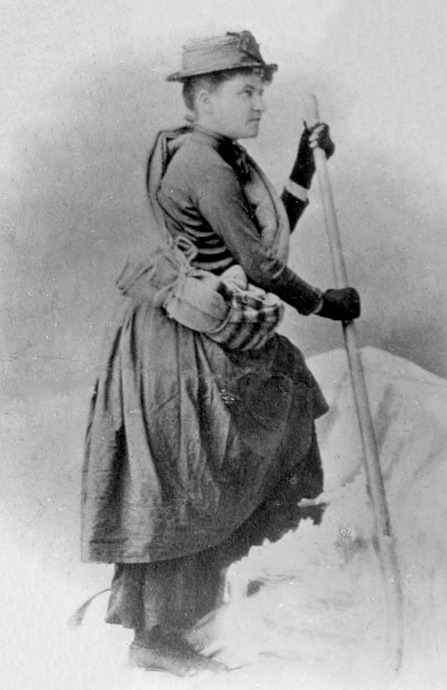 An online exhibit on the Museum of the White Mountains at Plymouth State University website, titled, Taking the Lead: Women and the White Mountains, notes that skirts had virtually disappeared by the mid-1910s, and by the 1930s women were wearing clothes similar to what female hikers wear today, including shorts and halter tops. 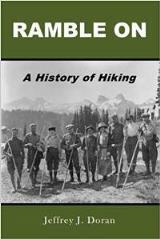 Ramble On: A History of Hiking chronicles the history of the first hikers, trails and hiking clubs, as well as the evolution of hiking gear and apparel, including many other stories about the attire both men and women wore during the early years of the sport. You can find the book on Amazon by clicking here.